Probably since the time schools came into existence school bells were used in the system, an indispensable piece of equipment for every school. They are basically a mechanical device that is able to produce a loud and sharp sound under the influence of an external applied force. Specifically, old fashioned school bells had the form of a large gong (circular brass disc). A wooden mallet (hammer) was used to hit or bang the gong, and produced a sharp ear piercing sound, audible from quite a far distance. The function of a school bell has fundamentally remained the same since the beginning – to divide the class periods into equal parts and indicate their start and finish with a distinctive sound. 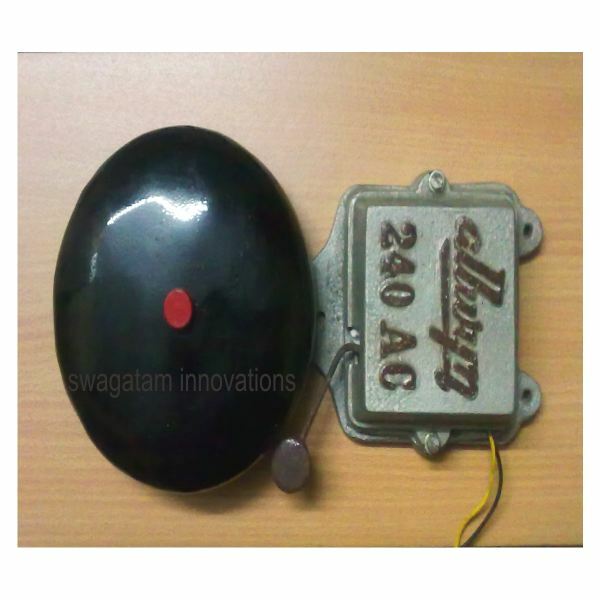 This type of bell has slowly been replaced by more efficient electric bells and they are in use even today in most schools for the same purpose. But one particular drawback of school bells is that these need to be operated manually and thus someone always needs to remain alert and activate the device on time. The job can be strenuous physically as well as mentally, and still, strangely, you will find many schools are not equipped with an automatic device that can do the job all by itself. The present article deals with a simple electronic school bell timer designed for the specific purpose of ringing the bell on time. When built it is able to switch ON and OFF an electric bell automatically, at regular time intervals, depending on its settings. Before we learn the construction details, let’s first make sure we know how an electric bell operates to make a school bell sound. How Do Electrical School Bells Work? An electric school bell is an electromechanical device, able to produce a shrill ringing sound through the repeated hammering of an inverted metallic bowl in the influence of electricity (See Image and Click to Enlarge)). There is a coil of wire wound over an iron core to form an electromagnet as part of the unit. When an electric current (AC mains) is applied to the two ends of the coil, due to the varying flux of the input AC the coil produces a strong varying magnetic field around it. A spring loaded iron shaft pivoted in close proximity to this coil vibrates rapidly in response to its magnetic field. This iron shaft is arranged that one end (a hammer shaped piece of metal) knocks a hollow cylindrical bowl shaped piece of metal while vibrating, to produce the required sharp and loud ringing noise – a typical school bell sound. In the next page we will discuss the functioning and the construction of the proposed circuit. 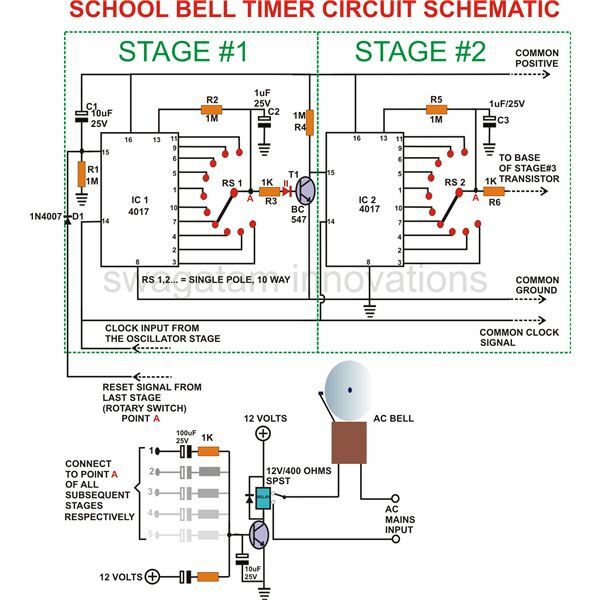 As the name suggests, the present circuit of a school bell timer is a set of electronic timers used to ring the school bell sequentially, after each class period has elapsed. Each of these sequentially arranged timers may be set or programmed individually through 10 discrete steps of 5 minutes each to get a total time interval of 50 minutes. Therefore, each of these timers are able to produce time intervals ranging from a minimum of 5 minutes to a maximum of 50 minutes, satisfying most school time tables. The circuit description of a single stage (the first one) should let you understand the whole operation of the unit, as each stage is just a repetition of the previous one. 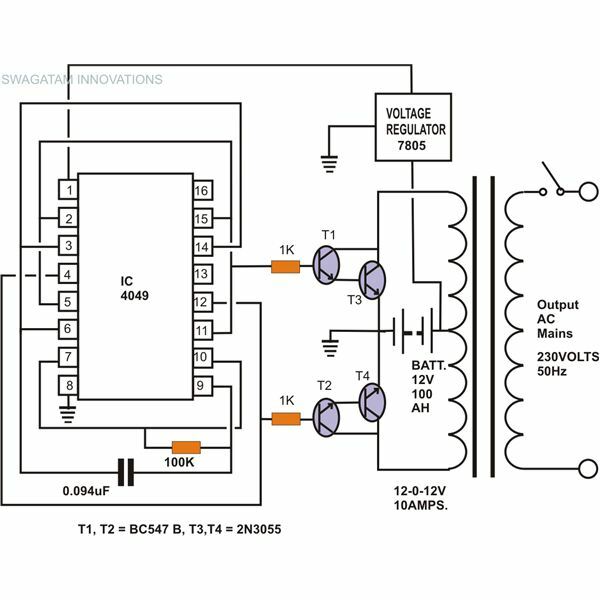 Before moving into the main timer circuit, it is important first to learn about the functioning of the oscillator circuit. IC 4060 is wired in its basic oscillator configuration with P1, P2, R3 and C5 defining its oscillating frequency. P2 is used for a coarse setting while P1 is used for refining the results. The value of C5 also determines the rate of oscillation, but its value will remain fixed and should be selected appropriately. The reset pin #12 is grounded so that the IC can start oscillating the moment power is switched ON. C1 makes it sure that the counting is initiated from 0 and not from any intermediate figure. The clock (oscillations) output is received at pin #3 and is used to drive the subsequent ICs of the main timer circuit. IC 7805 provides a clean regulated 5 volts supply to the whole unit. 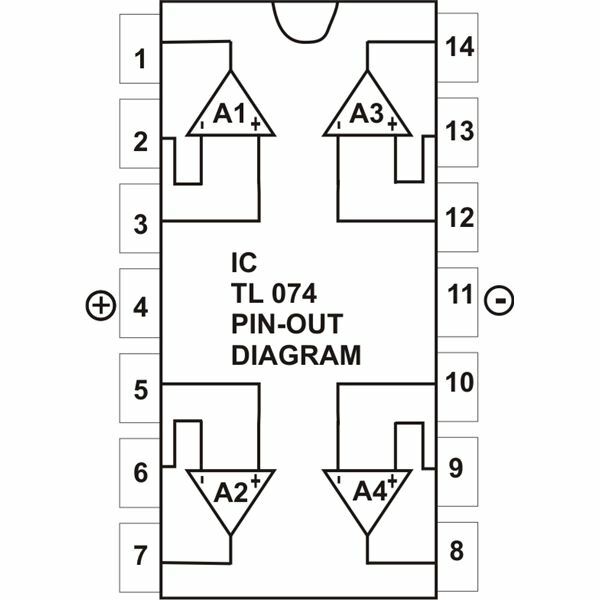 In one of my previous articles we discussed the pin outs of IC4017. 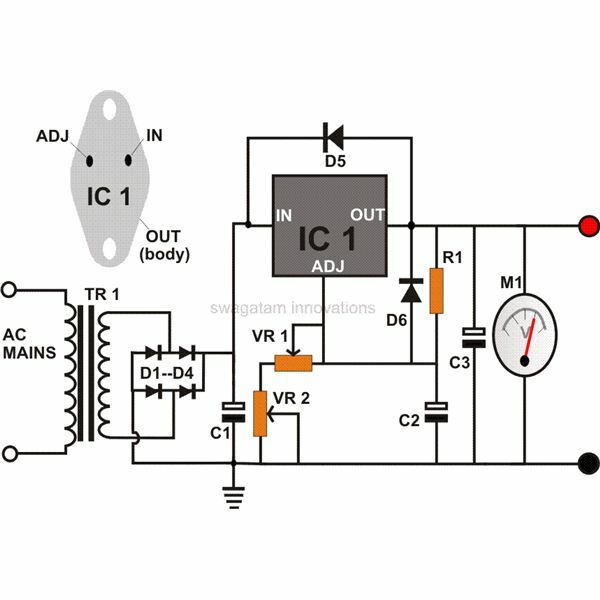 Referring to the article will help you to understand the present circuit better as it is primarily configured around IC 4017. Assume that the clock pulses received from the oscillator IC 4060 are set to exactly 5 minutes each. 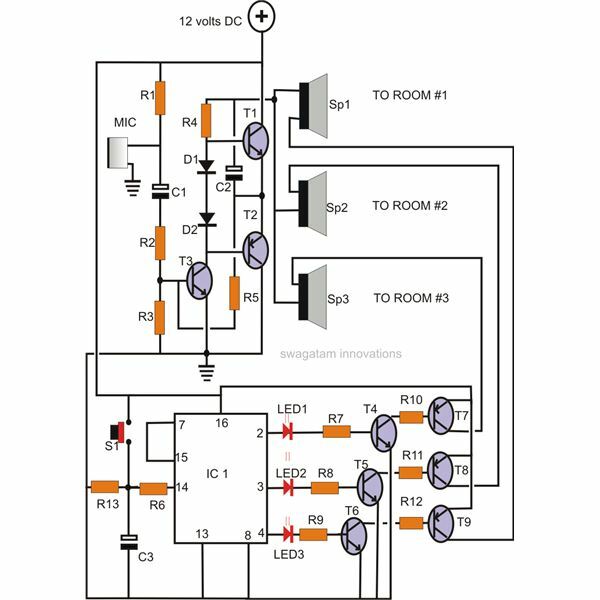 As soon as the power is switched ON (see diagram), C1 resets IC1 and it starts responding to the clock pulses received from the oscillator section, only because its reset pin # 15 is grounded via R1. Now if the slider arm of RS1 is placed at pin #1 of IC1, a clock high pulse will reach at this point after 25 minutes (since each sequential step is proceeding at a 5 minute rate). Now this logic high at the slider arm of RS1 will do two important things: Firstly, it will send a logic high signal to pin #13 of IC1 so that it “freezes” (latches) at that point and stops responding to the clock pulses at its pin #14. Secondly, the same logic pulse will also simultaneously be sent to the base of T1, which in turn will reset IC 2. IC 2 will now immediately start counting (responding to the clock pulses at its pin #14) and will repeat the same cycle as IC1, i.e. the slider arm of RS2 will become high after the set period, “freezing” itself and activating the third stage to continue the process, and so on until the last stage is reached. Once the time period of the last stage elapses, the whole activity comes to a stand still. Alternatively, if the logic high pulse from the slider arm of the last rotary switch is fed back to IC1 (pin #15 through D1) of the first stage, it will break the latch of the whole system and the cycle will restart all over again. Since point A (slider arm) of the rotary switch of each subsequent stage is also connected to the relay driver transistor, it activates the relay momentarily as these points go on to become high sequentially according to the relevant settings of the rotary switches. You may add as many stages as you want in the circuit, depending upon the number of required periods (time-table) for a particular school. In my prototype, I included provisions for as many as 33 stages. The relay connections are wired to the bell, which is rung periodically in response to the above functions. In fact, the present circuit can fulfill any task which requires an independently set, sequential switching of a particular load (wired to the relay contacts), so it can very easily be employed for other much complicated industrial operations. On the next page we look at the constuction steps to make the timer for the electric bell. 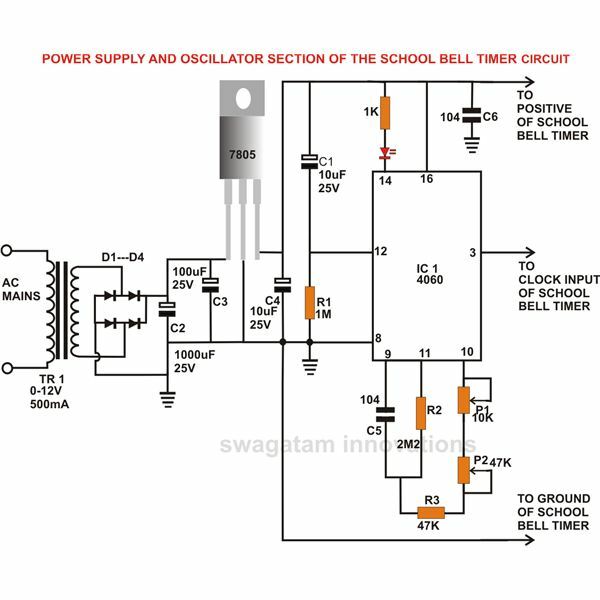 A designed PCB is strictly recommended for the construction of the present circuit of the school bell timer. Although I won’t be able to provide the layout of a designed PCB, designing your own version won’t be difficult at all, as, after designing the layout of the first stage, the layout of the required number of subsequent stages is simply duplicated. For my prototype, the PCB layout designing was done in “Corel Draw”, and I would say that the tools provided here are quite ideally suited for such tasks. Once you have a PCB, it’s just a matter of inserting and soldering the given components in their relevant positions correctly. 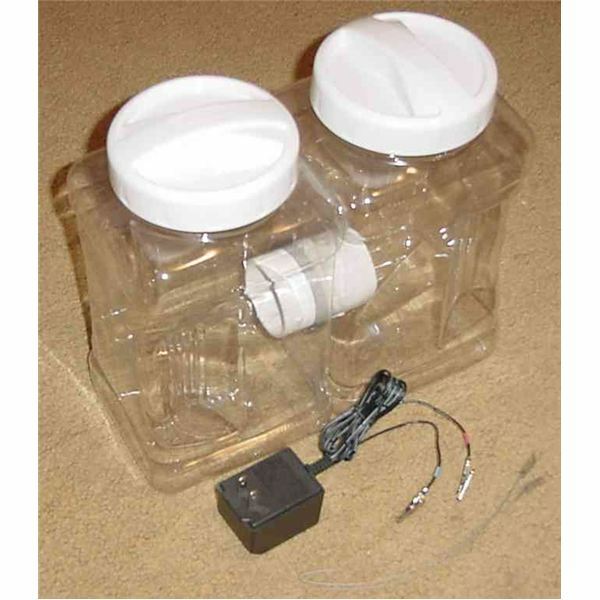 The whole assembled unit may be housed inside a strong and sturdy ABS plastic box with the rotary switch’s spindle, LEDs and mains cord coming out of the appropriately drilled holes over the front side of the box. Initially keep the oscillator stage disconnected from the main timer circuit. 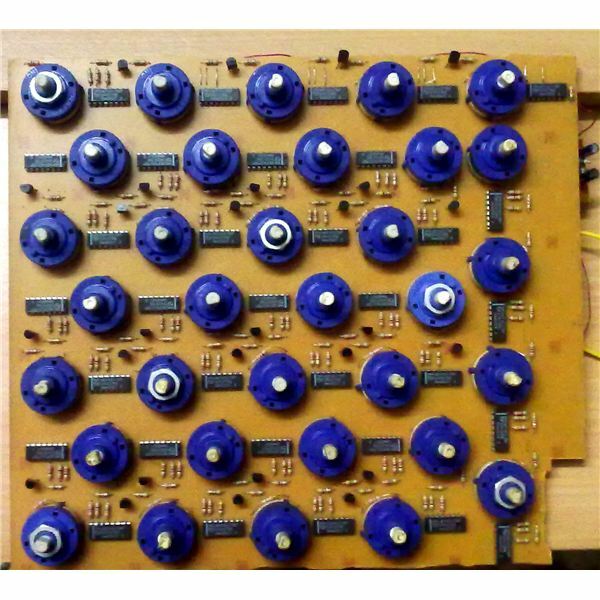 Through trial and error, set P1 and P2, so that the oscillator generates a clock pulse precisely every 5 minutes. Now set the rotary switch of all the timers to the minimum range i.e. at pin #4 of each stage. Connect a small electric bell to the relay contacts as shown in the diagram. Connect the oscillator section to the main timer section and power up the unit. Immediately, a start-up ring will be sounded by the bell, indicating that the timer (or the school periods) has commenced. An LED in the oscillator section should instantly start flashing, indicating that it’s working and providing the clock pulses to the timer stage. After precisely 5 minutes the base LED of T1 of the first timer stage should light up and the procedure should sequentially get repeated for the rest of the stages until the last stage is reached. Confirm the same action for other settings of the rotary switches of each stage. 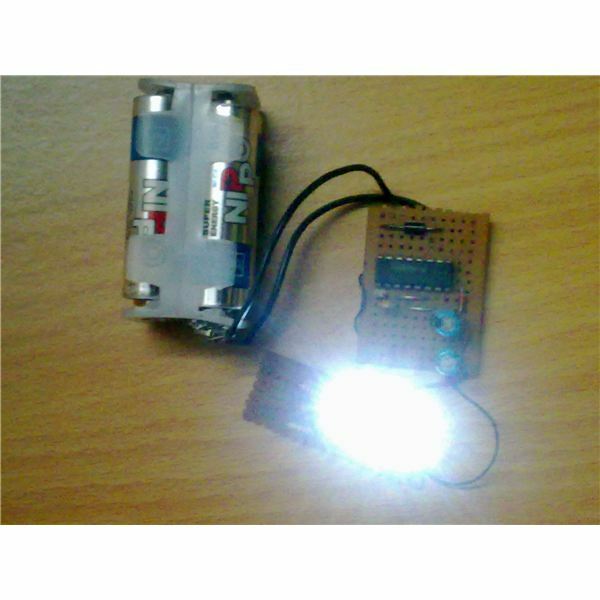 This concludes the construction as well as the setting up of the school bell timer circuit. The system should now automatically complete the desired functions faithfully for many years to come. If you require any further assistance, feel free to interact through comments (comments require moderation, may take time to appear).